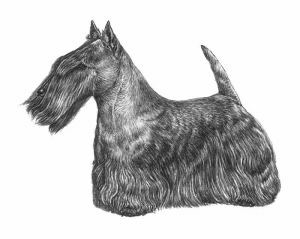 : The Scottish Terrier Club was formed in 1882, a year after the first standard for the breed was drawn up, and just three years after the start of the breed as we know it today by Capt Gordon Murray. He was strongly supported by the founder and first chairman of the Kennel Club, Mr Sewallis Evelyn Shirley. : Thick-set, of suitable size to go to ground, which would preclude dogs of excessive body weight, short-legged, alert in carriage and suggestive of great power and activity in small compass. Head gives impression of being long for size of dog. Very agile and active in spite of short legs. : Skull and foreface of equal length. : Loyal and faithful. Dignified, independent and reserved, but courageous and highly intelligent. Bold, but never aggressive. : Long without being out of proportion to size of dog. Carried on muscular neck of moderate length showing quality. : Nearly flat. Length of skull enabling it to be fairly wide and yet retain narrow appearance. : Slight but distinct stop between skull and foreface just in front of eye. : Black. Large, and, in profile, the line from nose towards chin appears to slope backwards. : Foreface strongly constructed and deep throughout. : Teeth large with perfect and regular scissor bite, i.e. upper teeth closely overlapping the lower teeth and set square to the jaws. : Cheek bones not protruding. : Almond-shaped, dark brown, fairly wide apart, well set under eyebrows with keen, intelligent expression. : Neat, fine texture, pointed, erect and set on top of skull but not too close together. Large, wide-based ears highly undesirable. : Muscular and of moderate length showing quality. : Proportionately short and very muscular. : Fairly broad and hung between forelegs. Well rounded ribs flattening to deep chest and carried well back. Powerfully coupling ribs to hindquarters. : Moderate length giving general balance to dog, thick at root and tapering towards tip. Set on with upright carriage or slight bend. : Brisket well in front of forelegs. : Must not be out nor placed under body. : Good size, well padded, toes well arched and close-knit, forefeet slightly larger than hind feet. : Good size, well padded, toes well arched and close-knit, hind feet slightly smaller than forefeet. : Remarkably powerful for size of dog. Big, wide buttocks. : Hocks short, strong, turning neither in nor out. : Smooth and free, straight both back and front with drive from behind and level gait throughout. : Close-lying, double coat; undercoat short, dense and soft; outer coat harsh, dense and wiry, together making a weather-resisting covering. : Black, wheaten or brindle of any shade. : 25 – 28 cms. : 8,5 - 10,5 kgs.